5th pick of the third round! Congrats to Morgan! Your the best! Outstanding! If I'not mistaken, she's the first UCD basketball player ever to be drafted by a pro team men or women. Preston Neumayr was drafted by the then Kansas City Kings as the 14th pick in Round 8 of the 1983 draft. As I recall he put off medical school a year to test the NBA. I don't think he was around by opening day....he is now a doctor in the Bay Area, so he landed on his feet. Thanks, 72Aggie. I remember Neumayr but had no idea he was drafted in 1983. I think Morgan will make the cut. She has great quickness inside and has the ability to stretch the floor and knock down perimeter jumpers as well. We were lucky to have her here throughout her basketball career. The ESPN WNBA draft show may have been just about the worst. Seems like ESPN just doesn't do women's basketball very well. How about this for a college basketball career! "Senior biomedical engineering major becomes the first Aggie to be drafted into the WNBA"
Our focus on academics first and foremost is truly what makes Aggie athletics special compared to the win at any cost programs. Yes and she was VERY successful academically in a very demanding major!! Being selected to the BWC ALL-Academic team three times since 2016. 2019 not out yet. I think that she will do well in the WNBA, but if not Europe will be there for her. Her success will also be very helpful to Jens recruiting efforts in the future. Regarding the recruiting help, here's a brief clip from one of the incoming recruits...she certainly has a lot of the same attributes as Morgan. Oldband, that clip of Megan Jones could have been Morgan. Uncanny, except she goes for the hair bob which Morgan never sported on the court. I think a team of Jones, Stobbart, Hall, Bessolo and Tripcic would be a very tough combination for the opposition to deal with; plus with very talented reserves in Konrad, McKweon, Song (who may start), and others. A Very formidable group! I must admit that my first thought when I found out that Morgan got drafted was, "the WNBA still exist? " I'm surprised that no one on this board gave a heads up that Morgan can potentially get drafted. All of a sudden the WNBA looks interesting to me. I had read a little about Morgan looking to the pro ranks but there wasn’t much buzz. And honestly I didn’t know the draft was happening until I got an espn update. Seems odd that they have the draft less than a week after the ncaa championship. First WNBA pre-season game is less than a month away (5/9); first Wings pre-season game is the 13th. Regular season opens on 5/24. Pretty compressed timeframe for the teams to get their draftees in camp and a roster figured out! Morgan's going to really be juggling her schoolwork and basketball now...wow. At least the Wings don't have a game on the same day as CoE commencments. Ha. 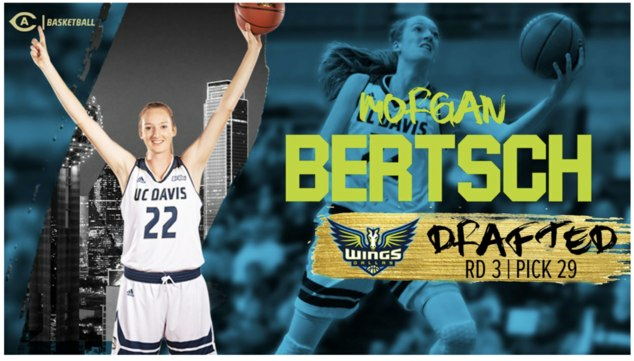 "2019 WNBA Draft Analysis: Dallas Wings sneak away with big win"
Great draft celebration for Morgan. She’s just so cool and confident. She will be a leader on that Dallas team both on the floor and in the locker room. By the way, my last post of my “fantasy team of 2019-20” did not include Kenedy Lily because I believe there is a 99% chance that Jen will RS her just like Morgan. She’s a real gem- no need to rush her IMHO. There is a great in-depth article about Morgan in the Santa Rosa Press Democrat (her home town paper) today. They are obviously very proud of her and there are many interesting facts in this article that have not been covered before. Sorry. I have yet to learn how to copy news articles to this site. Maybe one of you out there can give me a lesson? Copying a whole article tough, and maybe violates copyright laws? Practice with "copying" text. Step 1. If on a smartphone, hold your finger down on one word. Press. See the word highlight? Then drag one of the blue circles left or right to highlight 2 or 3 words. Step 2. If you have that word or phrase copied, when you are pressing down, a bar should pop up that gives you options - copy, paste, etc. Choose copy. Step 3. Flip somewhere else, press down, and choose paste. Copying a link to an article. One option is to go into the header up highest, and copy the URL / website address. Sometimes the whole URL isn't copied. Drag left or right to get the whole URL. Option 2. Sometimes a sideways V appears in the upper right corner which allows you to copy the link, and then paste. When you paste it, the beginning is typically http://paperaddress.com.45678. If you don't see the http or https, good chance you didn't get the beginning of the URL.